I bought Guy Finley's The Secret of Letting Go because I wanted to let go of a romantic relationship that had ended, but I discovered a much more powerful (and spiritual) form of 'letting go' - one that could literally transform my life. Whilst Guy's words are compelling, they are troubling too... This inspirational book is highly recommended! In fact, The Secret of Letting Go is about letting go of 'egoic pain', for want of a better expression. In fact, Guy's book - all of Guy Finley's teachings, actually (he writes books, gives talks, produces audio ebooks, DVDs - all as part of his not-for-profit Life of Learning Foundation) - is much more than a self-help book, it's a spiritual guide to living life fearlessly AND in the NOW. Yes, I think of Guy Finley as a kind of 'practical' Eckart Tolle - they both talk about the same 'truth', but just use different language. And, personally speaking, as much as I appreciate and enjoy reading Eckhart Tolle, Guy Finley's teachings seem to be more usable - to me, anyway. So what's in the book? Profound wisdom and 'truth', approached from many different angles that will force you to take a long, hard (and forgiving) look at yourself and who you blame for the troubles you've experienced in your life. If you've read or listened to anything by Guy Finley then you'll know what to expect from this life-changing book. And if not, then I highly recommend you buy The Secret of Letting Go as it's a great introduction to the teachings of Guy Finley. (1) I am not and never will be a fan of gurus per se, but I am a fan of 'Truth' - and Guy shows you a great glimpse of it, in his teachings and self help books, DVDs etc. (2) I've just finished The Essential Laws of Fearless Living by Guy Finley and, again, I found this book to be truly inspirational! 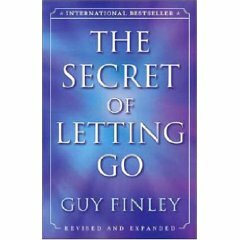 Have you read Guy Finley's The Secret of Letting Go? If so, what did you think about it? Please comment below - even if you haven't read Guy's book, all comments are welcome! Well I'm sure the author does know what he's talking about but trying to plough through this book is heavy going! I'm delighted that other readers have found it useful but I'd suggest you think very carefully before spending your money on it. Return to Best Self Help Book.